Birthplace : Mission Hills, California, U.S.
George Lopez is an American comedian, actor, and talk show host. He is mostly known for starring in his self-produced ABC sitcom George Lopez. His stand-up comedy examines race and ethnic relations, including the Mexican American culture. He was the host of the late-night talk show Lopez Tonight on TBS until its cancellation on August 10,2011. Born on April 23, 1961 in Mission Hills, California. Lopez has built a successful career by finding the humor in his difficult childhood and in the Mexican-American community in general. Abandoned by his mother, he was raised by his grandmother who paid him little attention. Lopez transformed his painful experiences into material for his stand up comedy act. By the late 1980s, Lopez was a successful comedian, playing clubs around the country and appearing on television shows and comedy specials. He made the jump to films in the 1990s with comedies such as Ski Patrol (1990) and Fatal Instinct (1993). In 2002, Lopez became one of the few Latinos to star in a television comedy series, following in the footsteps of Freddie Prinze and Desi Arnaz. The actress Sandra Bullock, an executive producer on the series, George Lopez, was instrumental in the show's creation. The show is based in part on Lopez's personal experiences. In addition to his television career, Lopez continues to perform as a stand up comic and to record comedy albums. Team Leader was nominated for the 2004 Grammy Award for Best Comedy Album. He also wrote an autobiography entitled Why You Crying, which was published that same year. Lopez faced some health challenges in 2005. Suffering from a genetic disorder, which caused his kidneys to deteriorate, Lopez received a kidney transplant that year. His wife Ann was the donor. The couple recovered quickly from the operation and have become spokespeople for the National Kidney Foundation. Regarded as one of the top comedians, Lopez has received several honors for his work and contributions to the Latino community, including the 2003 Latino Spirit Award for Excellence in Television. He was also named one of "The Top 25 Hispanics in America" by Time magazine in 2005. 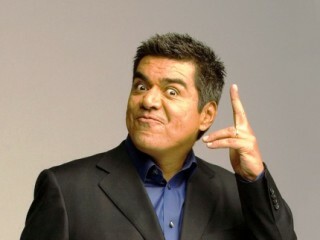 View the full website biography of George Lopez.